Mehndi is one thing that all Indian women adore – not just because it is an important part our culture, but also because of how beautiful the mehandi design looks when we are adorned with it. 1. 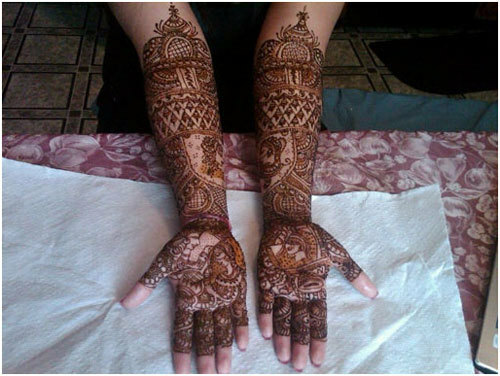 Here is a very beautiful yet very simple mehandi design for the hands. The design is mainly done on the thumb and the index finger. It is quite simple but still can be easily done for any occasion to draw attention to your hands. Great if you are attending an engagement ceremony or the sangeet of a friend’s friend! 2. 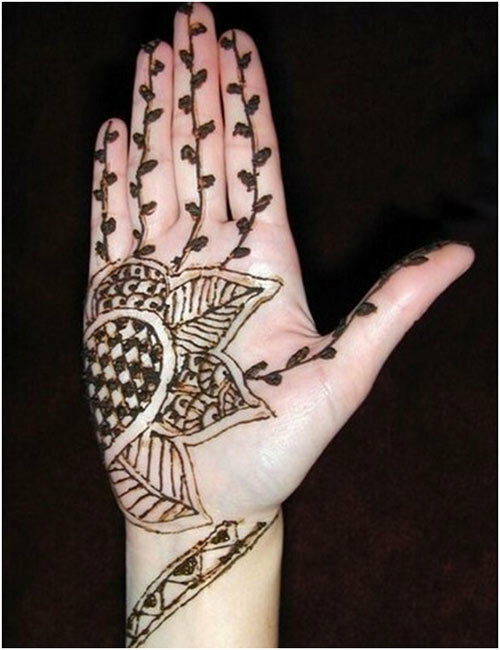 Here is an example of an easy mehndi design for hands where you can apply the mehendi on any one finger. On occasions where the attention will be on your hands or fingers – like an engagement or on your wedding day, you may use this type of design for your finger. This is specially applicable for women who don’t like heavy mehendi designs. It will look very really pretty if you do this on the ring finger. 3. We just loved this design as well as the matching nail art on the feet. The design is very simple, yet looks lovely. The use of the red mehndi gives a distinct bridal feel to the look and can be donned by anyone. It will suit most brides and the added accessories like toe rings will make it even more beautiful. 4. 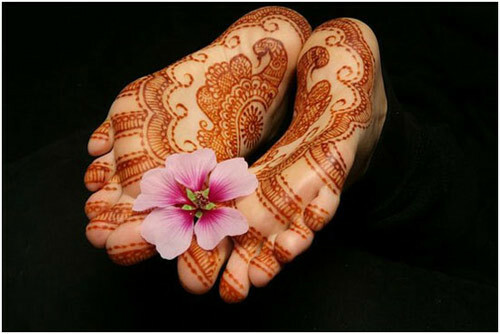 Love mehndi but do not want to apply lavish designs on your feet? Try this very simple and small design which is very easy to do. This will not interfere with your style and will blend in quite easily. This is for those who love small and hassle-free designs. 5. 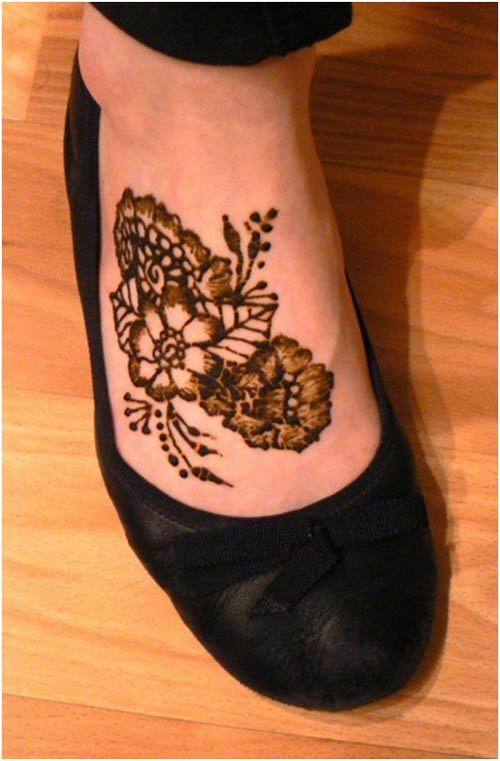 If you love floral patterns and also love using mehndi on your feet, try this style. 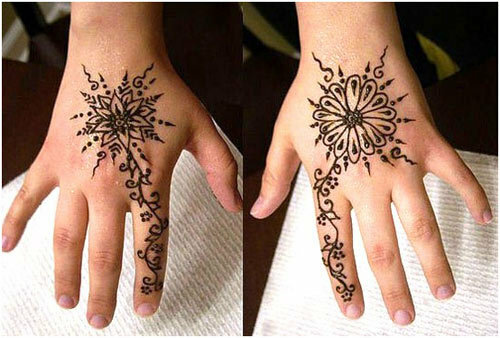 This sweet and simple mehendi design can be done by anyone for any occasion. 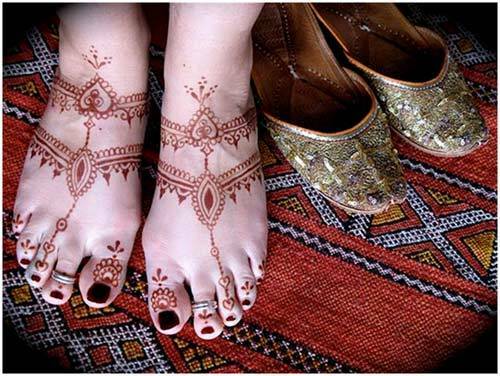 The use of mehndi makes the feet more prominent and this will also look great for office goers who love small designs on their feet. 6. 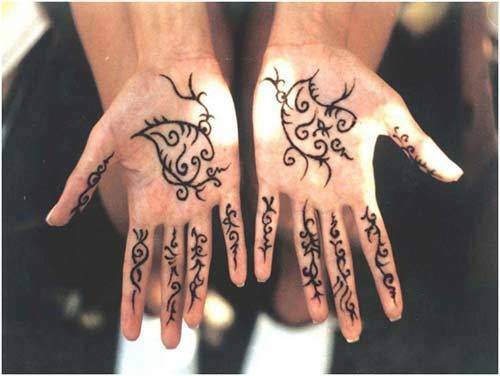 Do you love applying henna? Try this simple pattern which is very easy to do. And this will look great on everybody’s hands; be it your daughter’s or your own. You can make additions to this design and make it into a full-fledged design one as well. 7. 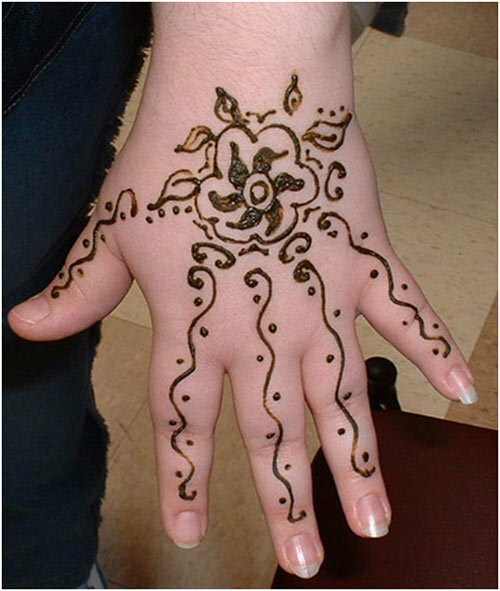 If you are new to mehndi application, then you may like to settle for one of the simplest mehndi designs initially. Behold! We have the perfect design for you! This design will flatter anyone, irrespective of their age. It will also look good on brides and on the occasion of their engagement too. The designs are not cluttered and are simple enough to be tried at home. 8. 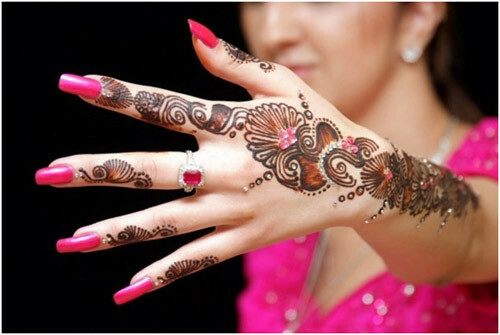 Recently there has been a new trend in mehendi, and it is the increased use of glitter and stones. Using glitter and stones looks good as sometimes mehndi can become boring with the same old colours and variations. Glitters and stones give you ample choice and you can easily settle for any colour of your choice! Glitter is applied over mehndi and the beads & stones are placed according to the design. The colours used can be changed or manipulated according to your outfit. This specially looks very attractive on the contemporary bride. In this design we see white stones and blue stones being used, which make this simple mehndi design look absolutely gorgeous. 9. 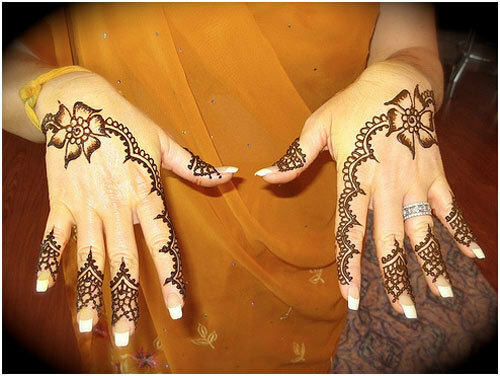 This design is quite different from the usual mehndi styles we are accustomed to seeing. The design is predominantly simple, yet it is unique. Perfect for a modern woman, who likes to mix trendy with traditional. 10. 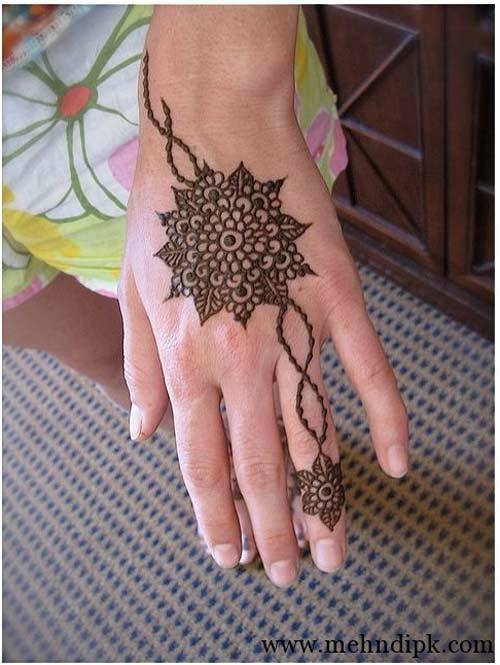 This is another one of the simple mehendi designs which is suitable for beginners. The design is great for any occasion. The unusual patterns on the fingers make this design quite unique. It has the predominant use of geometric shapes and dots, which is quite easy to do – even for beginners. 11. 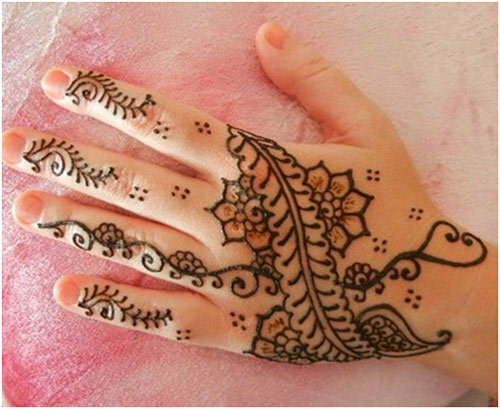 We love this simple yet pretty mehendi design. The design slightly leans towards the traditional side. 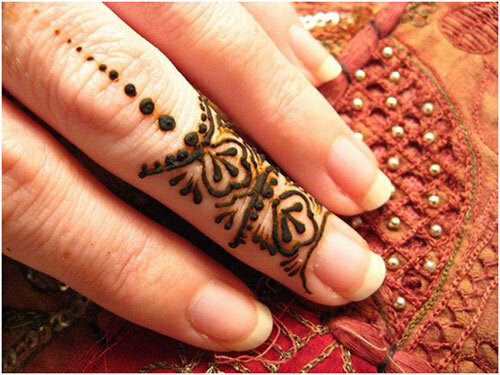 The shades and the motifs used for the mehndi are basically very simple. This will be apt for any occasion and will make your hands look full without actually filling it up entirely. 12. If you need a simple design with very less motifs and which is basically restricted to just the back of your hand, try this super chic design. 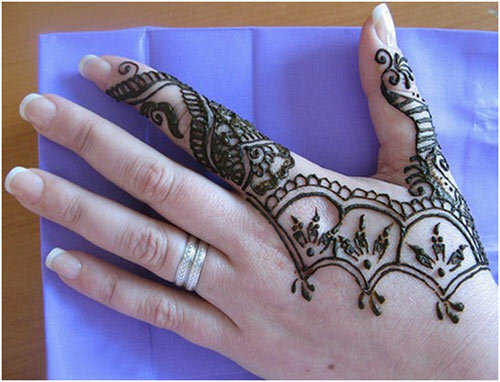 The design in the middle of both hands is quite easy to do and looks simple enough for any occasion. It will suit women of any age. 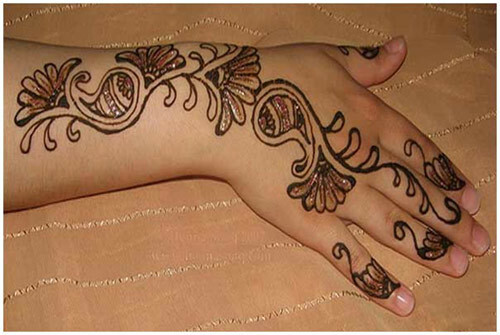 You can also display this mehndi design on your palms. 13. 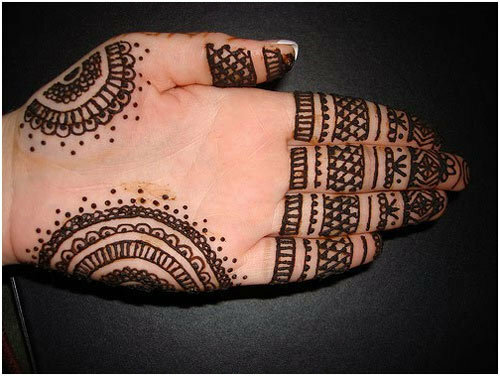 The back of the hand is beautifully decorated using this design that has very few, yet pretty motifs. The design covers most of the space on the hands yet does not look cluttered and the design on the ring finger is what makes this design specially appropriate for an engagement. 14. Here’s a very simple design for the feet. It has a floral and leaves pattern. The design is very simple. The most attractive feature of this mehendi art is the way the design is giving an impression of an anklet been worn. 15. We know you love mehandi clad feet so how about donning this pretty and unique style? The spiral designs look very unique and beautiful and this design will suit any occasion. Even brides may do this design on their feet. There are small details in the design which make it look very simple yet elegant. The predominant spiral design can be customized to give a fuller look. 16. This unique mehandi design for the feet just stole our hearts. The complete sole of the feet is decorated using lavish designs. The look is very bridal but at the same time can be used on any occasion. 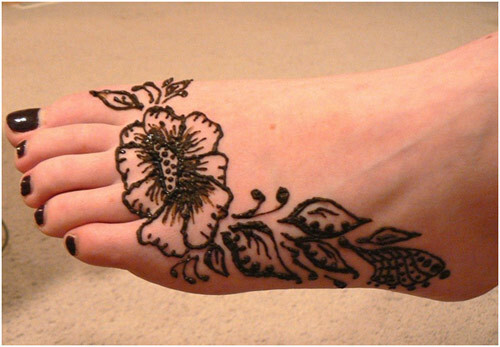 Though it is rare for one to apply mehndi on the sole of their feet, this can be a super cool way to adorn your feet. You can use any type of mehendi. This will look especially good on a bride as during the wedding there is a great deal of attention on the bride’s feet and it is often photographed. 17. 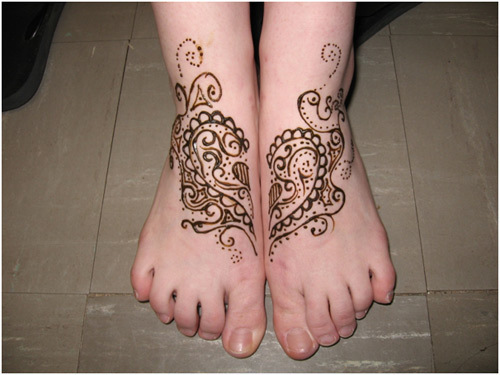 Want a mehndi tattoo design for the feet which can be done quickly? A simple design for the feet like this one will look just perfect with any outfit. Wear it with some nice ballerinas and you will have the world under your feet! 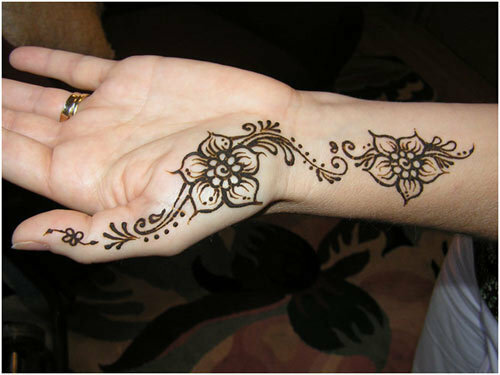 The shaded flower on the design is very unique as we hardly see a whole design shaded in traditional mehndi motifs. The shading has also been done using mehndi . 18. If you want a nice design for the engagement ceremony, you may want to consider this one. The design in the middle is quite intricate yet does not look cluttered – and highlights the ring finger. This design will suit any kind of occasion. 19. If elaborate designs are not your forte and you like simpler designs better, then this simple mehandi design is for you. It is extremely simple with no intricate or small patterns or motifs. The design looks very pretty and clutter-free. 20. This design is apt for the bride if she loves simple designs. The fingers are nicely highlighted and the back of the hands are also decorated with patterns. 21. Love glitter and stones? 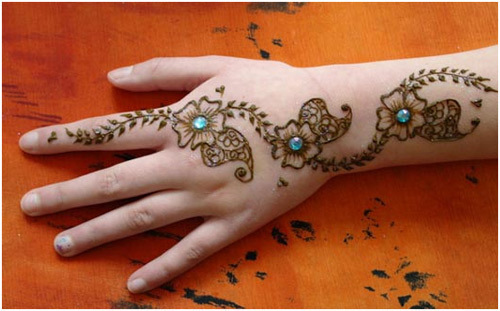 Then try this modern mehndi design which looks great on brides – and the bridesmaids as well. The use of stones and beads makes the design look unique as well as gives one the freedom to manipulate it according to one’s outfit. The crystal bindis add a whole new level of charm and bling to the design. 22. Here’s another example how you may add glitter to the mehendi design on your hands. This design has been given a unique touch with the use of tube glitter. This makes it ideal for any party or festival. The patterns, though traditional, have a unique contemporary look as a result of the introduction of glitter. 23. 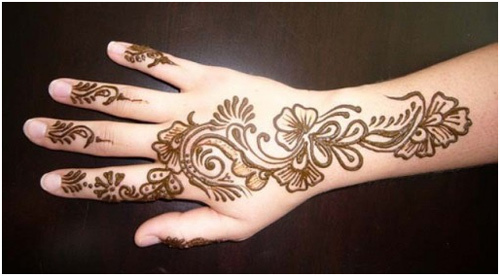 Floral motifs and mehndi come together to create this simple yet pretty design. The design is very simple – making it wearable for just anyone! It can be used for occasions like engagement parties as well. 24. Here’s a simple mehandi design for the feet. The design features anklet-like patterns on the feet. 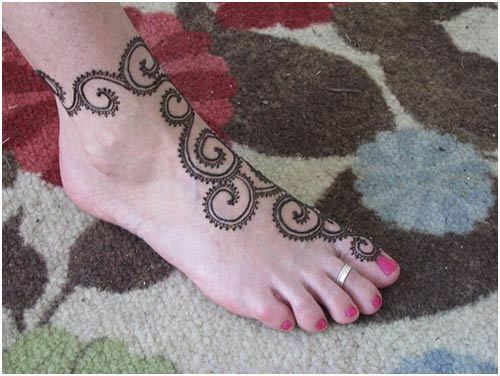 The connection from the middle toe to the main design along with the inclusion of small heart shaped patterns make this a very cute and apt design for the bride. Those looking for a simple yet very unique design for their feet can easily settle for this one. 25. 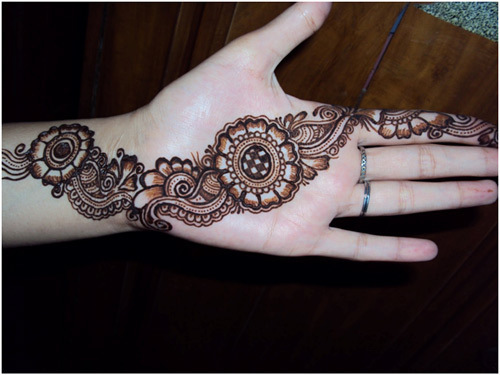 If you are a mehndi girl, then this design is perfect for you. This design includes small motifs for those who love minimal clutter designs. The design starts from the area near the elbows and ends at the fingers. Though there are no elaborate patterns and designs, this can easily be worn by a bride as their bridal mehendi. There is no shading and the motifs are fairly traditional. 26. This design is very good for children as it is very simple and fills their hands easily, making it less time consuming. It is especially good for children as they tend to be incapable of sitting still for long. You may even tell them to do the patterns themselves as this one is really easy to do and requires less perfection to look good. 27. 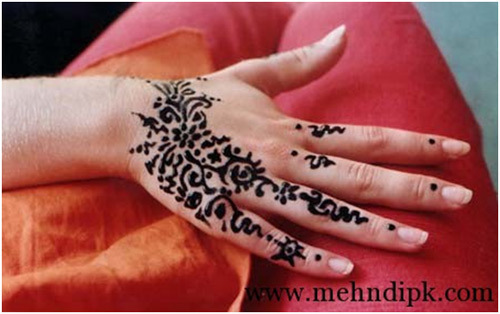 This mehandi design is for those who are new to mehndi and want simple designs which they can do themselves. There is very less design in this style and will require very less skill – making it apt for the beginners. 28. 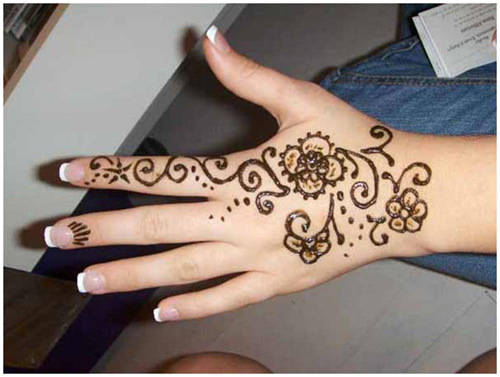 Want a chic mehndi design for the palm? Then you will love this design. With just the thumb decorated with patterns, this makes a great design for beginners as well as for those who like simple designs on their hands. The pattern starts from the wrists and ends at the thumb. The predominant floral pattern makes it apt for any occasion.